Large lidded Michael Cardew jar - 14" (355 mm) high. Michael Cardew was born in London in 1901. His parents had a summer home in Devon and used to take him to the Fremington Pottery where they bought pots from Edwin Beer Fishley. He loved these pots, much preferring them to the more formal table ware at the family's winter residence in Wimbledon. 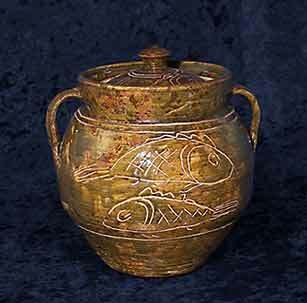 When Mr Fishley died, he realized that the pots he loved were gone forever; no one else made pots like them. He studied at Oxford University, and in his breaks, visited W Fishley Holland, Edwin Beer Fishley's grandson, at the Braunton Pottery. William readily agreed to teach him to throw for one pound a week. He heard about the St Ives Pottery, and on leaving Oxford went to join Bernard Leach as a student. Cardew stayed at St Ives until 1926 when he took over a disused pottery near Winchcombe in Gloucestershire, five miles from Cheltenham. At Winchcombe Pottery he was joined by Elijah Comfort, Sidney Tustin, and in the following few pre-war years by Charlie Tustin and Ray Finch. In 1939 he left Winchcombe Pottery in the capable hands of Ray Finch and set up a new pottery at Wenford Bridge, on the edge of Bodmin Moor in Cornwall. During the war Cardew was a Pottery Instructor in Achimota College in what is now Ghana - a Government backed venture that was to supply the whole of West Africa with good quality pottery, but was a dismal failure. Back home in 1945 he sold the Winchcombe Pottery to Ray Finch and then the following year he returned to Africa to set up a pottery at Vumë on the Volta river. This venture was to last until 1948 when a combination of ill-health and civil unrest drove him home to England. Ivan McMeekin, an Australian, had been looking after Wenford Bridge, and on his return to England Cardew made him a partner. McMeekin carried on in Cornwall while Cardew potted at Kingwood Pottery in Surrey. The items made here differed very much from his African pieces due to the materials available in Surrey that were not to be found in Africa. He made mainly slip-decorated wares at Kingwood, but the shapes were in his now very recognizable style. In 1949 he returned to Wenford Bridge, and the Kingwood pieces, marked with a 'K' in a circle, are somewhat rare. In 1950 he was appointed Pottery Officer in Nigeria. He started the Abuja Pottery, a training centre for native potters, and would spend ten months of each year there, and two months at Wenford Bridge, which was looked after by his partner, Ivan McMeekin. His work in Nigeria was a Civil Service appointment - he was a British civil servant when he started, but after 1960 when Nigeria gained its independence he was a Nigerian civil servant - and when he reached the age of sixty-five he had to retire. He visited both Abuja and Vumë after his retirement. He carried on working at Wenford Bridge, and was joined there by his son, Seth, in 1971. Many fine potters were students at Wenford Bridge, including Svend Bayer, Clive Bowen, Michael OBrien and Danlami Aliyu. Cardew taught by example, using few words. If handles were the topic of the day he would take his student to a board of pots and say "You start at that end, I'll start at this", and the student would watch the way Cardew worked the handles and copy him. He did not criticise his students' work, but would give lavish praise when he thought a pot was good. This is in contrast to the Leach Pottery practice of breaking pieces that did not come up to standard. Cardew was a naturally talkative man, but seldom offered an opinion about something he didn't like. The students, of course, knew what silence implied. Cardew's stoneware and slip decorated earthenware pots are distinctive. His work was exhibited widely, and he was awarded many honours before his death in 1983. He is remembered for his instructional book Pioneer Pottery and his unfinished autobiography A Pioneer Potter, edited by his son Seth and published after his death. Pioneer Pottery has been re-printed and is now available.